Confetti Polenta with Smoked Salmon and Chevre, Thyme for Cooking starters. Finely chopped pimento and chives in the polenta adds lots of color as well as flavor... And resembles confetti. Goat cheese and Pimento sauce have long been a favorite combination. Roughly line the bottom of 2 ramekins with cling film. Lightly oil. Heat chicken stock in a small saucepan until simmering. Add polenta, stirring constantly until thick, about 5 minutes. Remove from heat, stir in pimiento and chives. Spoon into ramekins and smooth the top. Let rest 10 minutes, then tip ramekins over onto each plate, removing polenta. Peel cling film off, leaving 2 circles of polenta. Sauté shallot in olive oil in a small saucepan until tender. Add pimiento, thyme, 3 tbs chicken stock and heat through. Purée, adding remaining 1 tbs chicken stock if needed (or use it to clean out blender). Return to saucepan, add tomato paste and heat through. Divide the goat cheese and spoon into the center of the polenta circles. 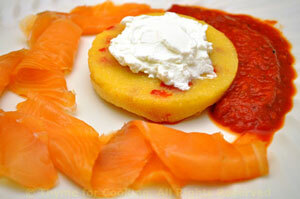 Slice salmon into wide strips and arrange on one side of polenta. Spoon Pimiento Sauce on the other. Serve.